Birmingham James Hardie Siding | Birmingham James Hardie | Birmingham James Hardy Siding | Birmingham James Hardie Fiber Cement SidingMcGlinch & Sons CO.
McGlinch & Sons Co. Home Improvements has been operating in business ever since 1917, and we are pleased to be able to serve residents of the entire Greater Detroit Metropolitan Area and Southern Michigan area. As a family-owned business that is well-trusted by many, we will offer you four-generations of accumulated education and familiarity within this trade. As a matter of fact, customer satisfaction is very important to us, and we have been able to prove ourselves for over 97 years now. Due to our knowledge and expertise in regards to James Hardie Siding and various types of exterior construction, we are known to be the very best! The James Hardie Siding brand name is highly regarded as being the America’s #1 Brand of Siding, which will add security, exquisiteness and sturdiness to your beautiful home. In fact, it will also boost up the value of your home while adding extra curb appeal. Our clientele do really love how the siding is weather resistant and thankful for the James Hardie Fiber Cement Siding being low maintenance! Thus, when any of the Birmingham locals are searching around for siding products for their homes, they will most likely come across McGlinch & Sons and will be pleased to know we offer the top of the line James Hardie Siding products! The great benefits of James Hardie Siding is the fact it is noncombustible, won’t fade and repells all sorts of weather conditions, plus being it’s five-times thicker than vinyl products! If you’re shopping around for siding, then James Hardie Siding is the siding that will be perfect for you! With James Hardie Sidin, you will not have to even be concerned with ever scraping or repainting your home, which is a big hassle that no homeowner wants to be bothered with. 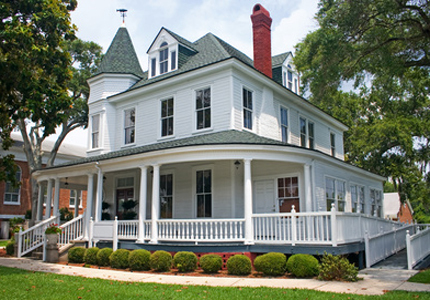 McGlinch & Sons’ James Hardie Siding will do so much better than both vinyl and wood siding products combined! Additionally, James Hardie Siding products will put an end to moisture and rot from humidity and rain. As Hurricane Sandy showed homeowners located on the Eastern Seaboard, James Hardie Siding is hurricane resistant, too. Of course living in Michigan we don’t have to be worried about hurricanes fortunately, but we do worry about the severe windstorms, hailstorms and tornadoes that we tend to have; by having James Hardie Siding; it will take care of it. It is impact-resistance against any hail and windblown debris, and James Hardie Fiber Cement Siding is recommended by gall building codes for homes found in hurricane, tornado and wildfire-prone areas. Just phone McGlinch & Sons at: (248) 987-6300 to get the best! Please don’t ever feel you need to settle for one-of-those one siding fits-all type of solution that many of our competitors offer. We’ll definitely take great care of you with our James Hardie Siding products!